Feed a crowd at a summer gathering with this vegetarian salad that shows off the flavors of summer. 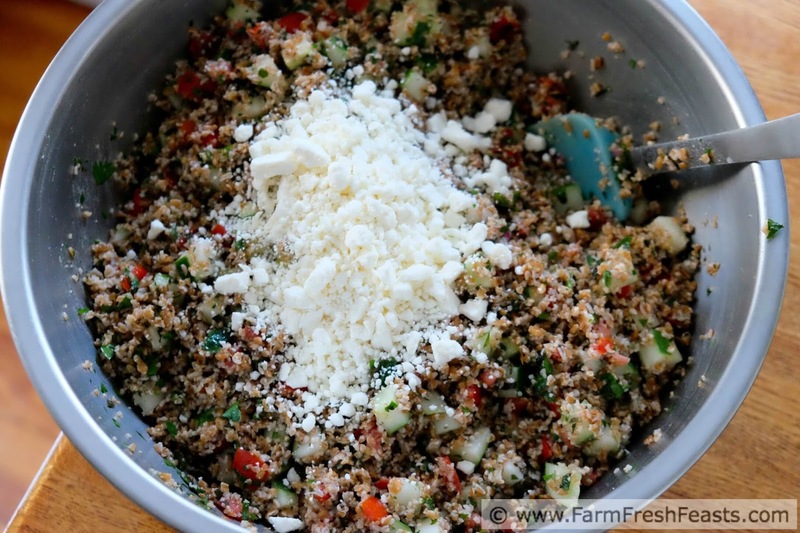 Packed with herbs, tomatoes, cucumber, feta, and chewy bulgur wheat grains lightly coated with lemon juice and olive oil this side dish can sit on a buffet table and keep its flavor. For other recipes using a massive bounty of herbs, please see my Herb Recipes Collection. For other recipes using Cucumbers, please see my Cucumber Recipes Collection. For other recipes using ripe red tomatoes, please see my Red & Yellow Tomato Recipes Collection. These collections are part of the Visual Recipe Index by Ingredient, a resource for folks like me eating from the farm share, the farmer's market, or the garden abundance. For another kitchen hack please see my Sun Gold Tomato Panzanella. Normally I'm just cooking for our family of four so when I go bigger with a recipe that works for a crowd, and also uses the produce from the Community Supported Agriculture (CSA) farm share, I want to share with the rest of the class. I've done it before with my Pot Luck Asian Chicken Cabbage Salad. The First Tomato of Summer [yes, worthy of capitalization if you're like me and just don't buy fresh tomatoes November through June] needs something worthy to celebrate its arrival [then you can move on to the weekly Summer Tomato Sandwich]. 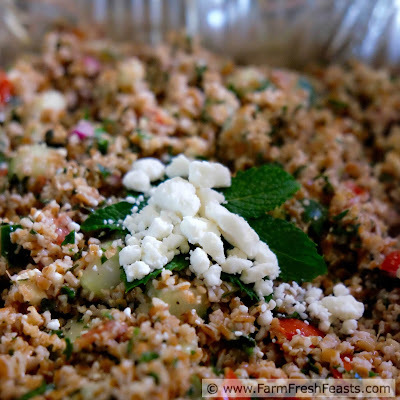 I'd been eying my unruly mint patch and craving tabbouleh--oh, my mommy pronounces it tah-BOO-lee so that's what I say--so I picked up a package of bulgur and gathered my goodies. I followed the directions on the package and used Bob's Red Mill Red Bulgur (Amazon affiliate link) . No sponsorship--I tell you the brand name because the recipe I started with came from the back of the package and because I'd never tried red bulgur before. Usually I buy it in bulk somewhere, and since I know the company name I thought I'd share. The product did work great, though, if you're looking for bulgur. I picked mine up at the grocery store down the street. 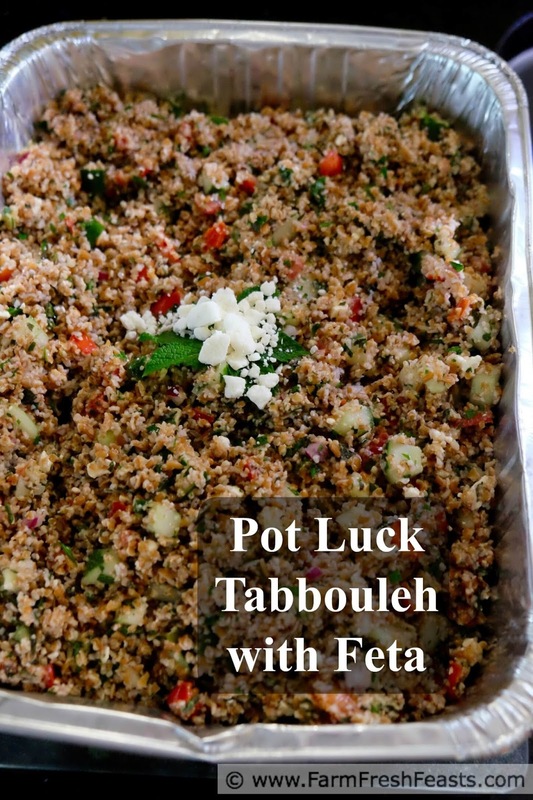 That tabbouleh was all I'd hoped for--bright and fresh with all the herbs, tangy but not gloppy from the dressing, crunchy from the cucumber, chewy and filling from the wheat. Plus the flavor of a local tomato picked when ripe and grown for flavor, not travel ability. /rant. After the success of that tabbouleh I thought it would be good with feta, and with loads of herbs still to use I was looking for an excuse a reason to make more. Lots more. Cue marching band camp--filled with hungry teens, who arrived promptly at 11:30 each day and, like polite locusts, left the serving area decimated 10 minutes later. The band has both vegetarians and kids with sophisticated taste, as well as my kid (I shouldn't rag on him, but he's delighted with leftover concession stand hot dogs . . .). I knew it would not be ignored. One musician came back for seconds 3 times! That's probably not called seconds, but you know what I mean. Note: I like to use a really large wide bowl for mixing, and use my clean hands initially to keep the grains from getting all clumped. Once I add in the seasonings I switch back to using a curved spatula/silicone scraper as shown below to help with the stirring. Another Note: If you've got pockets of time I'd make the bulgur the night before, since it sits and soaks up water for an hour. I'd be OK letting the seasoned grains sit in the fridge overnight before the vegetables are added, but would rather add the vegetables and cheese the day of serving. If serving away from home, add the olive oil and feta before you leave for the event. This can hang out at room temperature for at least an hour. I prefer the flavor at room temp over the flavor straight from the fridge anyway. Start this recipe the night before or morning of the event (see Another Note above). Place bulgur in a lidded saucepan (at least 1½ quarts) and pour boiling water over it. Stir to make sure all grains are submerged, the cover and let sit for an hour to absorb water and cool down. Prep the herbs while you wait (my kitchen hack is below). The original recipe says to drain the cooled bulgur. In the 3 times I made this, I did not need to drain the bulgur. YMMV. 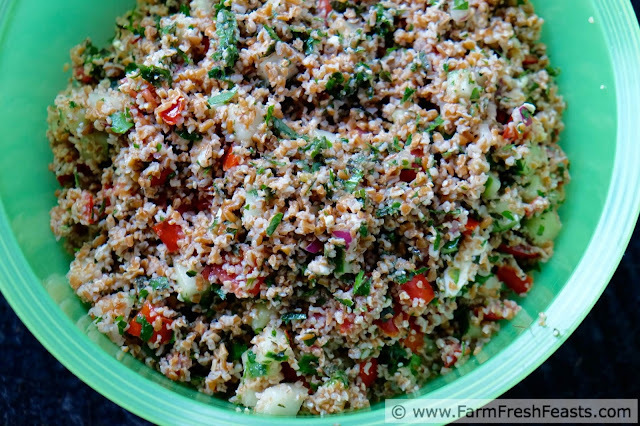 Transfer the cooled bulgur to a large bowl and sprinkle with the herbs and onion. Toss to combine (see first Note above). Sprinkle with seasonings and toss again. Add lemon juice and toss again. Add cucumbers and drained tomatoes and toss again. Chill for one up to 6 hours. When you're ready to serve, toss with olive oil and feta. *If I'm using my neighbor's garden produce since my cucumber plants shriveled up, or using farm share cucumbers, I just peel alternating strips off. If you are using a waxed cucumber from the grocery store I recommend taking off the whole peel. While I love my herb scissors (they're on an Amazon side bar somewhere) for chopping small amounts of leaves (like plowing through a stack of basil to chiffonade over a pizza), if I've got cups of herbs to deal with I use my pizza cutter. I just tear the leaves from the stems, form them into a pile on a cutting board, and zig zag my way through the pile with my pizza cutter until the herbs are reduced to the size I desire. It's fun, it's fast, it's easy. And my 4 year old pizza cutter (Amazon affiliate link) is easy to clean. Can't beat that. Yet another reason I need a pizza cutter. I think this was a fantastic use of fresh summer produce and herbs. I'd stick this on crackers or crusty French bread and make it a full meal. Ask for one from Santa? I wonder about loading up phyllo cups with this? !